We all love our 4-legged fur balls and want to make sure that they stay healthy. Getting your cat to the vet can be a challenging time. Unlike dogs, cats do not do well on leashes. The safest option for cats is to be put into a carrier. If you have cats, you know that they can master the art of hiding or escaping situations that they do not want to be in at lightning fast speeds. So how in the world are you going to get them in the cat carrier? It goes without saying that you should purchase a carrier made specifically to transport pets. Be sure not to make the mistake of putting cushions in a box or laundry carrier. Creating a makeshift carrier may only traumatize your cat. 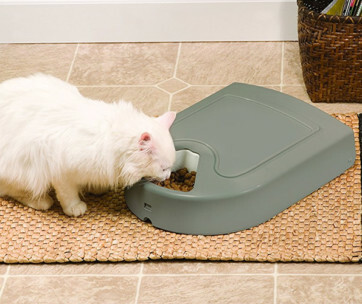 When purchasing your cat carrier, choose one that is fit for your pet. There are several different types, plastic ones with handles or softer ones with straps. Get a spacious one, but not too big. 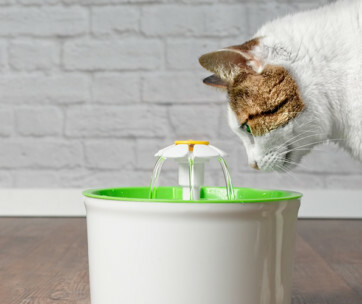 Another great option is to get one that opens from the top and the side, just in case your cat is having a hard time adjusting. A carrier should only be big enough for your cat to stand and turn around in. Anything bigger can be intimidating and anything smaller is not an ideal space to feel secure. After picking out the perfect carrier for your cat, introduce them to it! Place it somewhere in your home with a familiar item. The placement of the carrier is important to ensure it is welcoming to your cat. It should be in an area that your cat frequents, maybe in a closet or behind a couch. 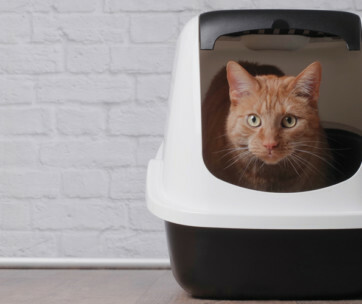 Leave the door open and put a small blanket, towel, or cat bed they use inside the carrier to encourage your cat to get in it. Leave cat treats near the doorway and inside the carrier for extra motivation! Once your carrier is prepared in a safe spot in your home, leave the door open and pretend like it is just another piece of furniture. 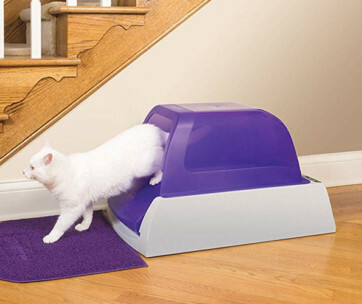 Your cat will be able to get familiar with it and decide if it is a suitable hiding place for them. 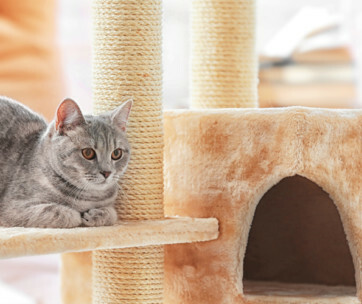 When your cat goes in and out of it frequently, close the door for small periods of time, maybe just a few seconds, to help your cat adjust to being enclosed. Each time you see your cat get into the carrier, give it another cat treat. You want your cat to know that it is a safe space for them. If your cat just won’t take to the new hiding place you’ve provided, don’t cancel their vet appointment! You are going to have to put them into the carrier, slowly and carefully. First, make sure that you put a towel in the carrier just in case your cat has an accident. To place your cat in the carrier, it is best to have the door to the carrier facing the ceiling. Turn in on its end and open the door. Pick your cat up, supporting his bottom with one of your hands. Lower your cat into the carrier with his rear end first. Being lowered into the carrier helps your cat feel more secure and is less likely to start a fight to get out of the situation. Once they are in, close the door and secure the latch! Treat lover’s associate treats with happiness, as many of us do. Slip some treats through the holes if your cat loves treats! It will convey the message that this will be a positive experience. If you know that it is going to be a battle getting your cat into the carrier, use the element of surprise. Some cats are just not going to cooperate. The best way to prevent injury to you is to surprise them with it! Make sure that the carrier is out of site. If you bring the carrier out and bang it around, you are going to be spending a lot of time looking for your cat around the house! Hide the carrier in another room with the door open standing on its end; pick up your cat for some loving as your make your way to the carrier, and put them through the door smoothly and quickly, rear end first! You must be fast while taking the surprise route or your cat will be back under the bed before you know it. Don’t stomp around the house chasing and scruff your cat to get them into the carrier. It will only reinforce that the carrier is a bad experience and can create traumatic feelings for your cat. 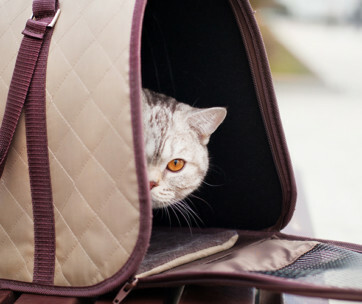 If your cat begins to show signs of stress like panting, drooling, or shaking inside the carrier, drape a towel or blanket over the carrier for the car ride to the vet. Often times, all the new views can overstimulate our furry friends and lead to high stress levels. If you are in a multi-cat household and plan on making a group visit to the vet, make sure that you have gotten each cat its own carrier. If your cat is experiencing a lot of stress, another cat could add to it. Remember to limit your cat’s time in the carrier to no more than 6 hours. If you are taking your cat on a vacation, be sure to schedule the appropriate stops at pet friendly hotels to give your cat a break. Cats are special to us and each one has their own unique personality. They will all respond differently when presented with the idea of a carrier. However, carriers are an essential way to ensure safety while driving and to make sure that our pets don’t miss their checkups! Prepare your cat for a positive carrier experience the best that you can. 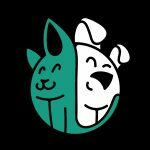 A Guide to Getting Your Cat in a Pet Carrier, Banfield.